President Major-General (Ret’d) Jioji Konrote told one of the longest serving Sisters of St Joseph of Cluny member, Angela Cavey, that all Fijians honour her on her special day. 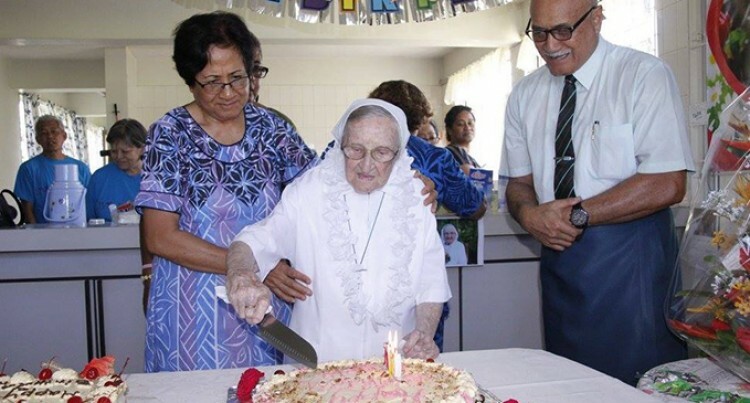 Sister Angela turned 100 yesterday and was celebrated at St Joseph Cluny House in Suva. The President attended the momentous occasion with First Lady Sarote, who both showered Sister Angela with a gift hamper and a bouquet of flowers. Sister Angela said the secret to her long life was allowing God to use her as His instrument. When asked how she felt about turning 100, Sister Cavey thanked God for the breath of life and was thankful for the kindness shown to her over the years. Sister Angela had been serving in Fiji for 42 years as secondary school teacher at St Joseph’s Secondary School, a teacher helper at St Anne’s School, SJSS secretary assistant and community worker. Provincial leader of the Sisters of St Joseph of Cluny, Allison Maccalister travelled all the way from New Zealand just to be part of the celebration. “We are very happy that she’s reached this stage especially that she’s still a vibrant and humble person who has had a great impact in many people’s life in her 100 years,” said Sister Maccalister. Sister Allison said Sister Angela worked in Africa, Australia, and Cook Islands before coming to Fiji. Sister Angela was born in Dublin, Ireland on January 25, 1917 and taught. The remainder of her service involved working with the community. The Sisters of St Joseph of Cluny will also celebrate their 129 years in Fiji this year.